ne of the founders of the City of Galveston, Michel B. Menard arrived in Texas in 1829. He was born near Montreal in 1805 and entered the fur trading company of John Jacob Astor at the age of 14. Menard arrived in Nacogodoches in the 1830s and began speculating in Texas land. Because land was only granted to Mexican- born Texans at that time, many of Menard’s land deals were made by Juan Seguin, a Mexican citizen who eventually fought under Sam Houston at the Battle of San Jacinto. Seguin purchased 4,600 acres at the eastern end of Galveston Island on behalf of Menard in December 1836. With this claim, Menard formed the Galveston City Company with Samuel May Williams and other prominent Texas businessmen in 1838. Galveston was incorporated a year later. The house, built in 1838 and the oldest on the island, is in the Greek revival style. The furniture and furnishings, with few exceptions, all date from the first half of the 19th century (1800-1850s). They are of the federal, empire, regency, Biedermeier, and William IV styles, as interpreted by American, English, French and German artisans. Carpets, drapes and upholstery fabrics are reproductions appropriate for the period 1830-1850. Michel Menard died in 1856 and his descendants occupied the house until 1879. In 1880, the house was bought by Edwin N. Ketchum. Ketchum was police chief during the 1900 Storm. The Ketchum family owned the home until the 1970s. During the early 1990s, the house was in such disrepair, it was threatened with demolition by the City of Galveston. The house and property were donated to Galveston Historical Foundation in 2016 and is available for private events. This museum property is not open for public tours, but can be viewed at 3302 Avenue O in Galveston, Texas. 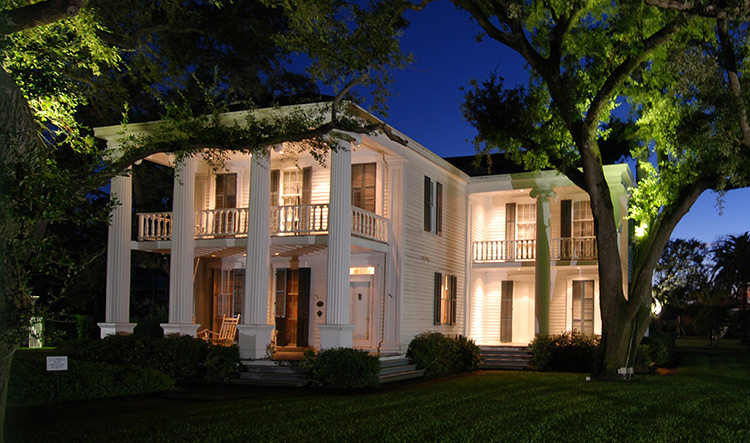 Galveston’s oldest home, the Greek revival Michel B. Menard House provides an intimate setting for small weddings, receptions, dinners and luncheons. Grand Ionic columns provide a backdrop for photos, and a lovely collection of period antiques fills the house’s interior. Shaded by stately live oaks, the landscaped grounds and gazebo also are available for outdoor functions. 75 for stand-up function and 24 for seated dinner. The dining room of the Menard House has been meticulously furnished with exquisite federal period antiques. 150 for stand-up function. The spacious, live-oak shaded grounds of the Menard House contain a romantic gazebo, perfect for sheltering a band, a buffet, or to serve as a podium for your special event. Menard Hall is a spacious detached facility set in the grounds of the Historic Menard Complex, which also includes the 1838 Michel B. Menard House and Menard Cottage. Menard Hall is ideal for meetings, lectures, and conferences. It is also the perfect setting for luncheons, dinners, weddings, receptions, showers and other events that require unique and elegant surroundings. The back yard and gazebo of the Menard House may be added as an additional venue at a nominal fee. Menard Hall: 96 for a seated event or 80 with a small dance floor. A caterer’s kitchen is available. $100.00 per hour, no furniture included. For further information call Lauraleigh Vogel, Historic Properties Rental Manager, at 409-765-3402. Galveston Historical Foundation is committed to making our programs and historic sites special needs accessible. However, at this time, the Menard House is not fully accessible to those with physical disabilities. If you have special needs contact 409-765-7834 in advance to your visit to make arrangements. Menard House is a privately owned and operated historic site listed on the National Register of Historic Places.